ISS calibrate all major brands of test equipment to current industry standards in our own laboratories, giving unequalled turnaround times. Click here to view our current calibration price list. Fully traceable to international standards and full calibration certification give you the peace of mind that your tester meets the current legislation. Step 3: That’s it! We will contact you for payment once the tester has passed calibration. We will then send the tester back to your desired address. If your tester fails calibration we will contact you with a quote for any repair work needed. If you have any questions regarding the status of your calibration or need any additional services like UKAS accreditation please contact us. This is a calibration certificate created by us at ISS. This is a fully traceable calibration certificate to National and International standards, the instruments used in our calibration lab are themselves calibrated to UKAS standards. The certificate will show your companies details, tester information, proven test results and the equipment used to carry out the test. Nearly 90% of all calibrations we do are done in-house in one of our many fully equipped laboratories. You can add this service to your order on the product page before you checkout. 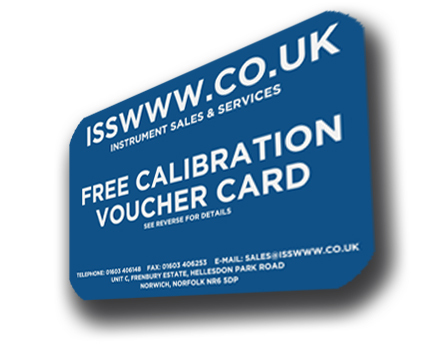 Isswww.co.uk is proud to offer our calibration voucher cards. These calibration voucher cards are given away on select products. When you purchase any of our testers with the offer, you will be supplied with a free calibration voucher card. This card entitles you to a free calibration on any 17th edition electrical tester. Send your tester, the voucher card and your contact details to our head office in Norwich. You can find our address under the contacts tab. Your tester will be calibrated and returned free of charge to your desired delivery address. !!! IMPORTANT – DO NOT LOSE YOUR CALIBRATION VOUCHER CARD!!! The voucher card can only be redeemed by returning the physical card to us. Lost voucher cards cannot be redeemed under any circumstances. If you are wondering if your purchase is eligable for calibration promotion, please contact us.